The data pins are D0 through D7. Pins 17 through 25 are the grounding pins. 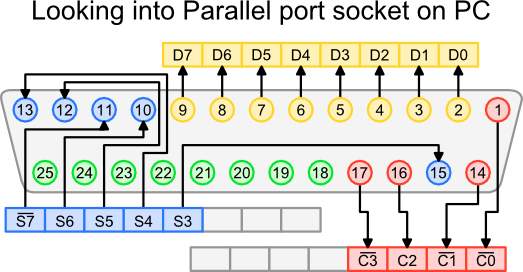 Based on the equivalence of both parallel port versions, pport accepts both standards transparently, either 9 pin or 25 pin serial rs232 connector. With this option one can select an alternative port. Causes pport to set one, some, or all pins to high. Or to set all low with “none”. 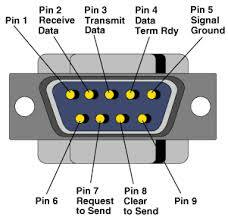 dtr and rts are available only in combination with the serial port. One can also use all and none with the serial port option in order to set both RTS and DTR lines to high respectively low. Causes pport to toggle the state of the specified pins. Where n is a number, causes pport to wait a specific time before altering the state of the specified pins, where n is a number, and d stands for days, h for hours, m for minutes and s for seconds. Causes pport to restore the previous state of the pins stored in the data file. Makes pport give a status report on the parallel port. Will turn on debugging for the following command. Will send raw data through the parallel port. Will set all the pins to high after a 10 minutes delay. Will set some random pins to high after a 5 seconds delay. Will restore the previous pin states. This can be useful if you want to include pport in your startup scripts so it can restore your device status on system startup. Will toggle pins 2, 4 and 7 into their complementary state after 10 seconds. Will set the rts line of the rs232 port to the high state. Will set both lines of the rs232 port to the high state. Will set both lines of the rs232 port to the low state. Will send data through the parallel port. 1. The pport utility, must be able to access the ports in the first place. Failure to do so will result in an error. Thus pport must have superuser priviledges at runtime. Below are listed two options for controlling the parallel port under Linux. The first option writes directly to the parallel port memory address. It’s simple and works well, but because of the low level access, you’ll need to have root privileges. The second option, uses the ppdev module for user-space access, that means you don’t need root privileges. Compile either source file using the following command line. The code below is the user-mode version. It accesses the parallel port via the ppdev driver. You’ll need to make sure that the driver is compiled into your kernel, or compiled as a module then loaded. The first command below can be used to check if the module is loaded, the second will load it. The ppdev kernel driver can be found in the location shown below. NOTE: Arguments to the ioctl function are passed by pointer, so be careful when using the functions. This is why mode, dir, dataH and dataL are defined first, then their addresses are passed to ioctl. Happy Hacking with parallel port! !